We already reviewed the 21.5-inch iMac 4K, so here will focus our efforts on the 27-inch iMac 5K. In particular, we're looking at the base model which has historically been the dominant choice for those want to make the jump to the larger display but don't need the power and graphical capabilities of a tricked out machine, like the i9 and Vega graphics provide this year. The iMac is an iconic design that has graced designers, students, and families desks for years. Throughout that time, Apple has iterated on the design just a few times. In 2012 —the last time Apple updated the aesthetics —it was much needed. It slimmed up the body to a new tapered physique but was otherwise the same, tried and true design. 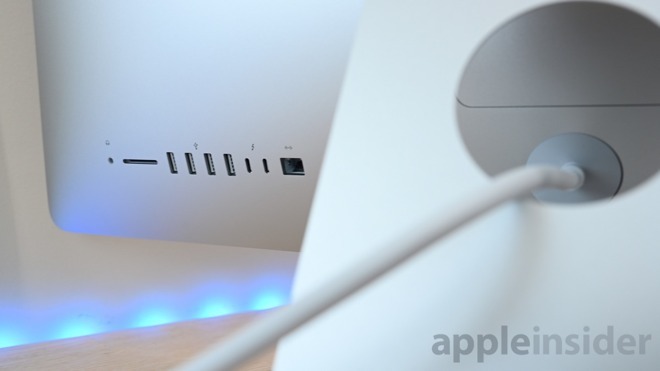 This year, Apple once again updated the internals but passed on making any exterior changes. The adage "if it's not broken, don't fix it" comes to mind. A big concern surrounding the refreshed line is the thermal limitations of this aging case, especially with the beefy —and hot —processors that the line can hold, especially on the high end. Otherwise, the design still holds its own well enough after seven years. 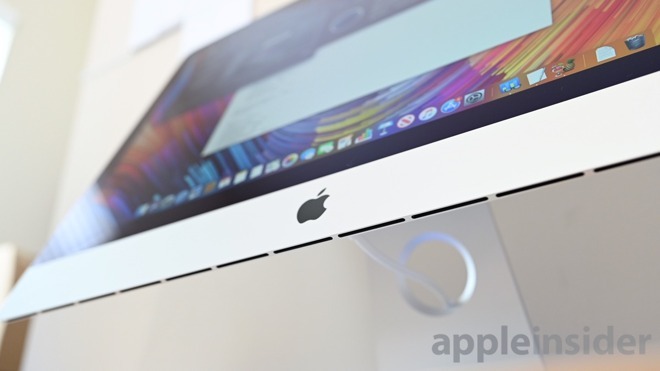 The chin is a bit large and those bezels can be eyesores, at least according to Internet chatter, but otherwise, the 2019 iMac is a standout within the all-in-one market. The all-aluminum build quality is still second-to-none, proving how far ahead Apple was when this design debuted. This review is focusing on the iMac 5K base unit with a 3.0GHz 6-core Intel Core i5 processor, but configurations are available all the way up to a 3.6GHz 8-core Intel Core i9 processor. Most people won't need that i9, so in this review, we will be discussing primarily that base unit. Aside from the Core i5 processor, this model also comes equipped with 8GB of 2666MHz DDR4 RAM, a Radeon Pro 580X GPU with 8GB of GDDR5 VRAM, and a 2TB Fusion Drive. A few worthwhile upgrades we may consider include swapping out that 2TB Fusion Drive for an SSD or increasing the RAM. Going with an SSD gets you faster boot times, faster file transfers, and faster editing — whether photo, video, or audio. By swapping the Fusion Drive for an SSD you could opt for external Thunderbolt 3 media to offer additional capacity with a faster machine. As for the RAM, if you'd like more, you can do so through Apple's configuration or you could do it yourself. The process is simple and straightforward when you pick up some aftermarket RAM. OWC offers capacities up to 128GB — double what Apple offers, and at lower price points. Intel's processors here haven't hugely changed, but the higher frequency and added cores has led to some solid increases in speed. 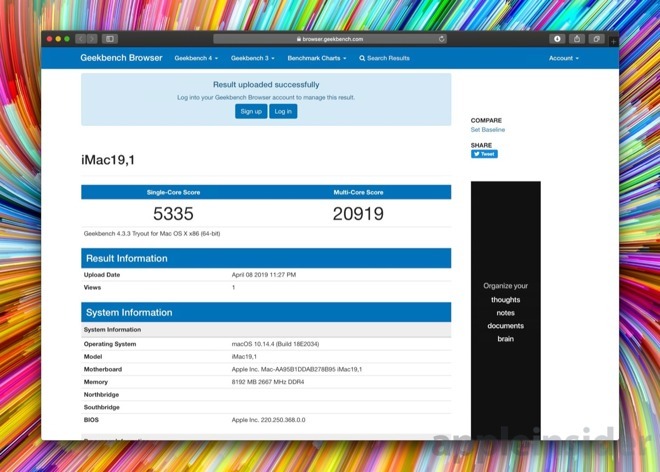 Geekbench 4 results were 5335 and 20919 on the single and multi-core tests respectively. Comparatively, that is a 32 percent gain on the multi-core test against the base 2017 27-inch iMac. 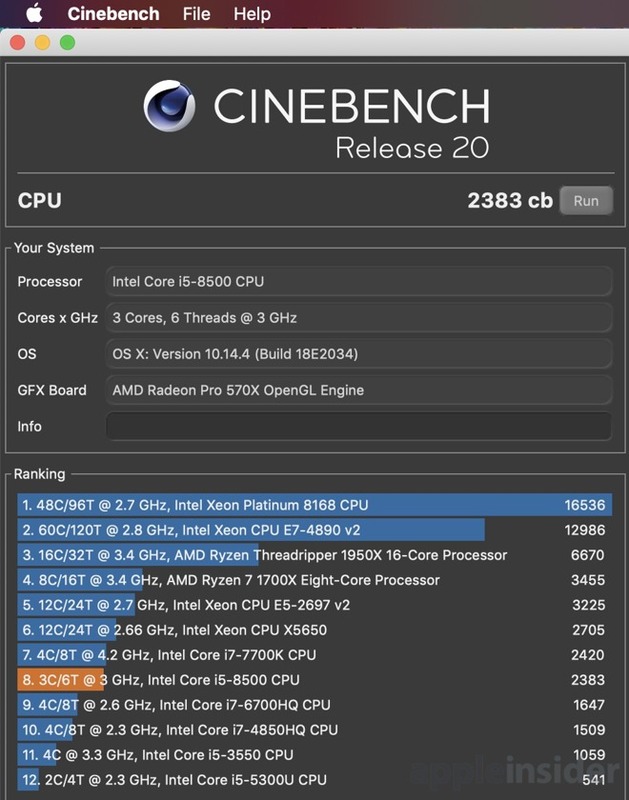 Cinebench R20 has replaced the R15 benchmark we've run in the past and is incompatible when comparing. We ran the test many times back-to-back-to-back to not only gauge the results, but see how the hardware handled when pushed to its thermal limits. The thermal headroom on these iMacs was a concern to us, with the thermal cooling system designed for processors from 2012. There was a very real chance that the machine would be inefficient in cooling itself and require lowering the clock speed of the processor below the rated speed, resulting in less-than-promised performance while under load. Luckily, that wasn't the case. Using Intel Power Gadget to monitor the CPU temperature and clock speed, even as the temperature increases the processor never dipped below the advertised speed of 3.6GHz. In the test, we pulled an average of 2383, which was well above the 1472 we earned on the base iMac 4K. In other testing, we ran the Unigine Heaven gaming benchmark which resulted in a score of 1104 with an average FPS of 43.8. The Blackmagic disk speed test also gave us write speeds of 876.9 MB/sec and read speeds of 1450 MB/sec —but longer transfers beyond the 32GB of flash storage in the drive will be slower. Like we said, a SSD would do wonders. The iMac has always been a great desktop. It is absurdly popular and has remained best-in-class. 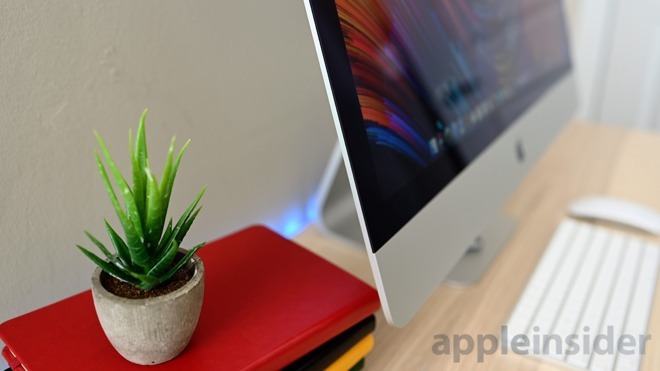 The 2019 iMac 5K is no different. 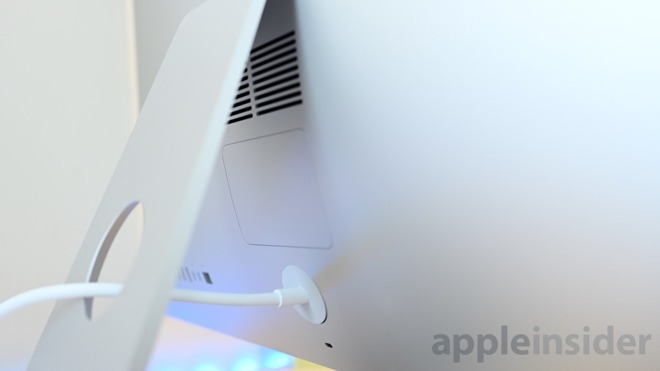 The ports on the back are solid, though in this day and age we are looking for less USB-A and more USB-C on the iMac 5K, if perhaps not the iMac 4K. Considering the mass-market appeal, we get Apple's choice but don't love it. This was ok in 2017, but in 2019 it should really be all USB-C and Thunderbolt 3. We've said it before, ripping off the USB-A band-aid is the only way to go, here. Unlike on the iMac 4K, we were able to get the fans to kick in on the new iMac 5K, particularly when running the benchmarks or pounding on the CPU. The fans were noticeable but not too loud. Compared to a tower PC that can be placed off the desk, it can be annoying at times in a quiet room having the fans kicking in. For everyday use, in a typical office environment, you probably won't ever hear them spin up. This iMac, like all the others, comes with a wireless Magic Keyboard and a Magic Mouse 2, though you can opt for a Magic Trackpad 2 or both together. We do love Apple's peripherals but are yearning for more. The lack of Touch Bar is noticeable, good or bad, depending on your inclination. While many dismiss the Touch Bar, we did find ourselves missing it. Filling in forms, working in pro apps, and using our customized shortcuts were all less convenient than they otherwise would be. More problematic is the lack of Touch ID and the T2. One aspect of this can be offset somewhat by wearing an Apple Watch, and using that for authentication. But, without the T2 chip, there is no "Hey Siri" support, nor hardware-assisted video encoding beyond Quicksync native to the CPU. In our tests, we saw large boosts in video encoding performance with Macs that had the T2 rather than those that didn't. The display in the iMac is still excellent, grabbing your attention the moment you sit in front of it. With its 16:10 resolution of 5,120 x 2,880, sitting at a normal distance pixels are still indiscernible. Colors are excellent and it makes us still yearn for that Apple-designed display that was promised long ago. From the outside, the iMac is the same. We've stressed that point enough. That means it doesn't grab a lot of headlines and if you skimmed the text, this could be a review from five years ago. However, that doesn't mean that this isn't a powerful, and capable machine in 2019. The speed increase from the 2017 base model to the 2019 base model is fairly substantial and while it doesn't warrant an upgrade from the 2017 models, it will appease anyone shopping for an iMac today. There aren't huge differences in performance from the top 21.5-inch iMac to the base 27-inch iMac so either option is entirely suitable based on your space requirements. There is plenty of upgrade potential at purchase here, most tantalizing is that fast 8-core i9 processor —but we will leave that for another review. 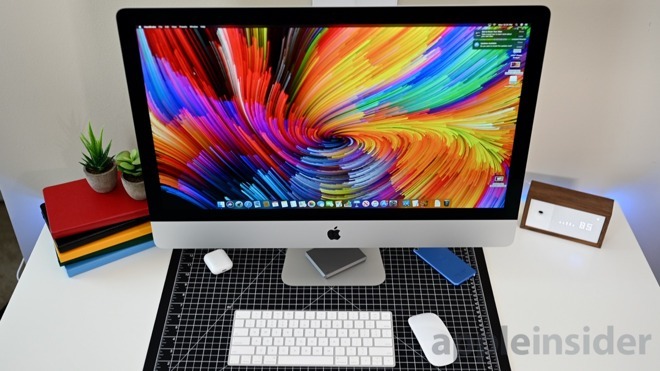 Apple's new 2019 27-inch iMac 5K is currently $50 to $150 off at Apple authorized reseller Adorama with coupon code APINSIDER. Prices start at just $1,949 for the CTO models after the coupon discount, with full step-by-step instructions for redeeming the code available in our savings guide. 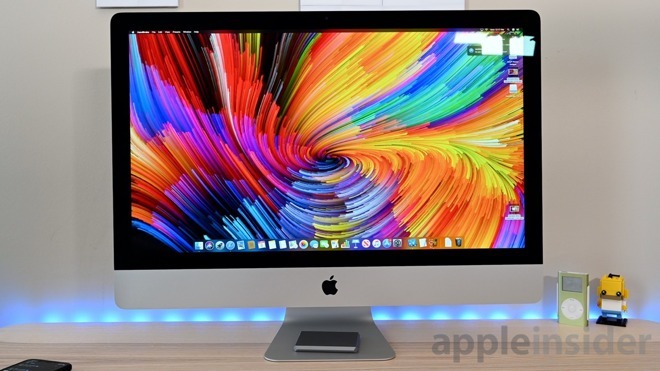 For a full rundown of the latest deals and product availability, be sure to visit our 27-inch iMac 5K Price Guide, which is updated throughout the day.